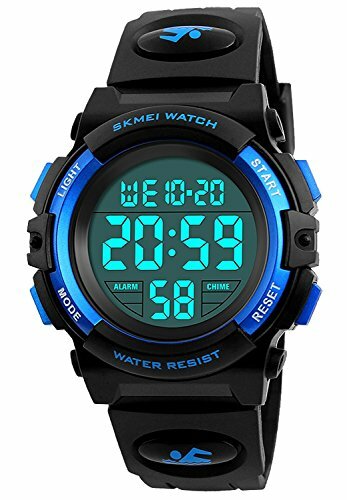 Boys Girls 50M Waterproof Watches,Sports Watch, LED Digital Watch Features Alarm, Stopwatch , Kids Watch (Blue) by Gosasa at Watches Sales. MPN: skmei-1266. Hurry! Limited time offer. Offer valid only while supplies last. We are professional watch sellers, selling any kinds of watches for men/women. If you need any help about watches, a good choice to contact us. We are professional watch sellers, selling any kinds of watches for men/women. If you need any help about watches, a good choice to contact us. Feature: Anti-Magnetic,Anti-Vibration, Alarm, Stopwatch, Date & Week & Calendar, LED Night Light. This is a multi-functional child watch, designed for Boys and Girls 4-12 years old, As a gift to the children's best choice. Long Time Japanese High quality movement.Long Battery Life Display time. "Waterproof: 164 Ft / 50 M water resist, Support to swim and bathe in cold water. Please DONOT press any buttons underwater, and in case of damaging waterproof ring,please keep it away from steam and hot water. "